Despite the tragic events of 2 Kings, hope remains as God holds to his promise never to forsake David’s line. This historical book has everyday relevance as it shows both the consequences of idolatry and God’s concern for people in serious hardship. Most important, it prepares us to see our need for the true and greatest Prophet and King. Tracing the overarching narrative, Philip Graham Ryken connects it to Christ and explores its applications for ordinary Christians in today’s world. 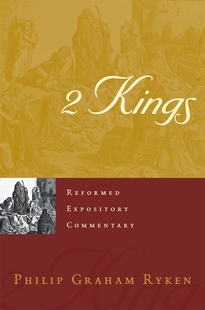 As are all Reformed Expository Commentaries, this book is accessible to both pastors and lay readers. Each volume in the series gives careful attention to the biblical text, is doctrinally Reformed, focuses on Christ through the lens of redemptive history, and applies the Bible to our contemporary setting.